Commercial off-the-shelf (COTS) refers to products that are sold in commercial markets that may be procured for government-funded use. Motivations for the use of COTS products include cost savings and faster times to deployment. COTS electronics typically consist of circuitry and associated software designed by private enterprise. These products are available for purchase by multiple buyers, across multiple products, and in multiple application spaces. InHand’s Fury-F6 is an example of a COTS electronic product: This single board computer (SBC) contains a Freescale i.MX 6 ARM processor, has on-board memory, a variety of standard peripherals, with Android or Linux operating systems. COTS single board computers are designed for general use in a variety of applications with a standard set of features. Modified COTS products utilize a COTS product as a starting point, and then are customized to satisfy a product requirement. The original design timeframe and costs of a COTS product are already incurred, creating advantages to using COTS and modified COTS products over custom designs. The advantages of modified COTS include: faster time to completion, lower engineering costs, minimized risk, and optimized product design. Modified COTS projects utilize proven schematics, printed circuit board (PCB) artwork, and operating system design files as starting points. The only changes that are made to the original COTS board are those required to meet product specifications making calendar time savings of 50% or more likely compared to that of a fully custom design. Additionally, because the supplier of the COTS platform has invested internal research and development (IRAD) money for the initial design and debug of the platform, clients can save over 75% on engineering costs over custom design options. And because modified COTS projects start with an already proven platform, the risk of original design errors – which would require debug and correction – is greatly reduced, facilitating on-time and on-budget projects. Finally, unnecessary features may be removed from a modified COTS product during design modification, enabling optimized feature sets while reducing power consumption and recurring costs. Modifying COTS products may range from relatively minor tweaks, such as redefining connector pin assignments, to extensive changes, such as adding capability for additional interfaces. 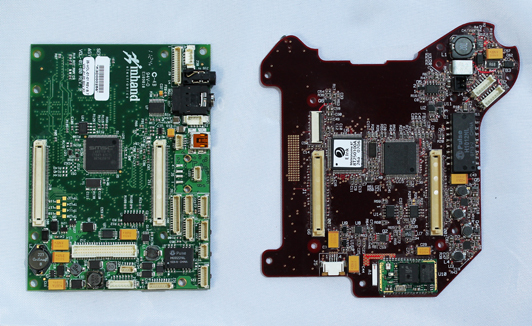 InHand has successfully executed multiple modified COTS designs based on its Fury SBC. The Fury contains a Texas Instruments DM3730 microprocessor and includes battery charging, touch screen/LCD interface, camera input, and Ethernet, USB, serial and GPIO interfaces. By leveraging the COTS Fury SBC hardware and operating systems, InHand’s modified COTS approach to Project A yielded the following benefits, as compared to a design from scratch (utilizing InHand’s Fury design): 80% savings of both labor hours and total engineering costs, and 50% savings of circuit board respin costs due to reduced occurrence of first design spin bugs, a result of lower design risk. The customization of existing off-the-shelf products to meet specific project requirements becomes an essential alternative as engineering budgets continue to be tight and time-to-market advantages become more critical. The use of modified COTS reduces cost, time, and risk. It also enables the creation of application-specific designs that are optimized to meet requirements more efficiently and effectively. These benefits combined with the ever-evolving market pressures ensure that the use of modified COTS designs will continue to grow in importance- especially as the principles behind modifying COTS electronics adapts to applications beyond hardware and software to packaged devices, such as tablets…but I’ll save that topic for another day.